CSMS Magazine » Have you ever tried pumpkin and tomato laksa? You Are Here: Home » CSMS Tips, News » Have you ever tried pumpkin and tomato laksa? Have you ever tried pumpkin and tomato laksa? Cut the pumpkin into large chunks and place in the top of a steamer. The pumpkin should be tender in 12 to 14 minutes. Remove from the heat. Chop the chiles, removing the seeds first if you wish, peel the garlic and ginger and chop roughly. Put them together all into a food processor. Discard the outer leaves of the lemongrass and roughly chop the inner leaves, shred the lime leaves, then add them to chiles. Scrub the cilantro roots and add them to the chiles, along with half the cilantro leaves and stems. Process to a pulp. Place a fairly deep pot over a moderate heat, add half the spice paste and try it, moving it round the pot so it does not scorch. Do this for a minute or two, then pour in the stock and coconut milk and bring to a boil. 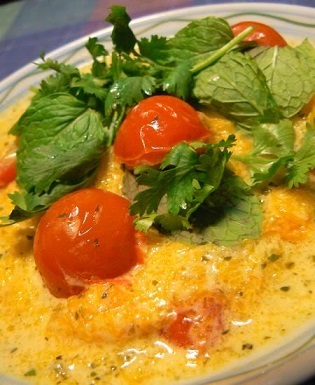 Cut the tomatoes in half and add them to the soup with the nam pla and lemon juice. They will take 7 to 10 minutes to cook. Add the pumpkin and continue cooking for a minute or two. Place a swirl of cooked noodles in each of the 4 bowls, pour over the laska and add the mint and the remaining cilantro.